Today my co-worker, Jeannie and I completed a 25-year anniversary timeline showcase. Little did I know that this project, encouraged by IMSA President, Max McGee, would be the topic for a blog entry. Over the past couple weeks I’ve been gathering ‘artifacts’ that represent projects or points in time in the history of the Illinois Mathematics and Science Academy imsa.edu and imsa25.com. The original project consisted of my trying to find one significant accomplishment for each year of IMSA’s 25 to represent in the showcase. A written and graphic timeline was created with those ‘milestones’ first, then I set out to find the artifacts. Hindsight taught me two things: 1) this should have been a collaborative process; and 2) it would have been easier (OK, much more interesting) to make meaning out of an artifact than vice versa. The IMSA Archives folks were a big help and the office where I work was very tolerant of the mess I made in the hallway laying out the ‘stuff” I had collected. It was when a year had a caption, but no artifact that puzzled me. How can an entire year pass and not create an artifact? But I wasn’t looking in the right place. As we were installing the showcase something magical happened. First, students and staff stopped to watch what we were doing instead of walking by. Something in their routine (and path) had changed and caught their attention. Second, they took interest in some part of the timeline and became collaborators. First it was Brenda in my office who at first didn’t seem too interested and then kept bringing me more publications and news articles than I could use. Then it was a different Brenda (in Attendance), who could watch the progress of the showcase right across from her office and offered supplies and yearbooks. “Q” from Admissions made multiple trips out with items he rounded up. Next it was John, a charter faculty, who thought of a couple items, including his “Pioneering Community” 25-year old sweatshirt he still had at home and Joan who made multiple trips back and forth from her office with a charter class photo, charter class commencement program, 25 year old mug and more she had squirrel away in her office. Yes, I had gone about this all wrong. Though trophies and newspaper articles and “flashy” objects were my original goal, I came upon the realization that time is marked not by these “things,” but in the meaningful treasures we personally collect in our lives and the memories they represent. A new idea emerged yesterday. This case should not be static, it ought to change throughout this milestone year. 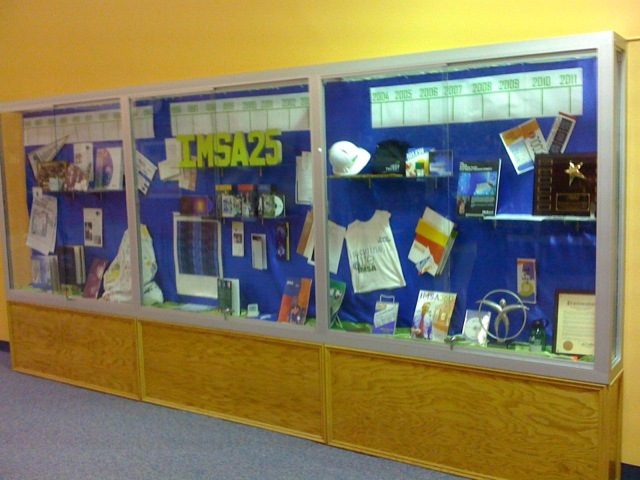 So I’ve decided to turn this showcase into an organic community project and plan to email the faculty and staff and invite them to submit their artifacts from the past 25 years to be part of a changing display throughout the year. For who am I to determine which one item fairly represents what IMSA was in a particular year? Thanks Max for urging me on this project (that wasn’t on my ‘to do’ list), it has been a great exercise as part of my job as Director of IMSA25, but more importantly has sunk deeper into my conscience to make me realize what truly is important in life. I am very much looking forward to seeing the IMSA25 timeline. I love the story of long-time staff and faculty bringing out their “treasures” for inclusion. I like thinking what my personal timeline showcase would include — definitely art, photographs and my first cameras, clothing, books, lamps, coffee mug — much more interesting than a flat scrapbook.